The writing client needed an education consultant resume and was hoping to combine his two previous fields of employment, Data Analyst and Teacher, into a role as a School District Data Coach. One potential difficulty was that the client has not taught in over a decade. Fortunately, this professional provided some education data consulting in the past few years while also working as a corporate data analyst. Since the data analyst role is the most robust, the writer listed a few consulting roles first so that they didn’t get buried in the document. Additionally, the resume started with an introductory paragraph and Summary of Qualifications. In these sections, the client’s proficiencies in utilizing his data analysis skills to train teachers and improve instruction were highlighted. The goal was for the employer to clearly see how hiring a data analyst that also has experience in education would be the best possible scenario. Education and Certifications were listed to demonstrate that this client is fully qualified. 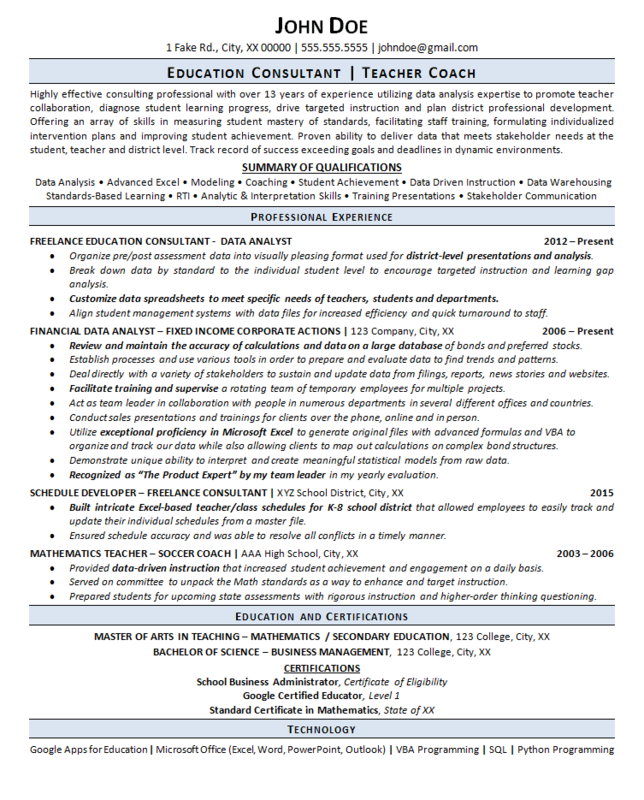 The resume concluded with relevant technology skills that apply to data analysis. Highly effective consulting professional with over 13 years of experience utilizing data analysis expertise to promote teacher collaboration, diagnose student learning progress, drive targeted instruction and plan district professional development. Offering an array of skills in measuring student mastery of standards, facilitating staff training, formulating individualized intervention plans and improving student achievement. Proven ability to deliver data that meets stakeholder needs at the student, teacher and district level. Track record of success exceeding goals and deadlines in dynamic environments. Organize pre/post assessment data into visually pleasing format used for district-level presentations and analysis. Break down data by standard to the individual student level to encourage targeted instruction and learning gap analysis. Customize data spreadsheets to meet specific needs of teachers, students and departments. Align student management systems with data files for increased efficiency and quick turnaround to staff. Review and maintain the accuracy of calculations and data on a large database of bonds and preferred stocks. Establish processes and use various tools in order to prepare and evaluate data to find trends and patterns. Deal directly with a variety of stakeholders to sustain and update data from filings, reports, news stories and websites. Facilitate training and supervise a rotating team of temporary employees for multiple projects. Act as team leader in collaboration with people in numerous departments in several different offices and countries. Conduct sales presentations and trainings for clients over the phone, online and in person. Utilize exceptional proficiency in Microsoft Excel to generate original files with advanced formulas and VBA to organize and track our data while also allowing clients to map out calculations on complex bond structures. Demonstrate unique ability to interpret and create meaningful statistical models from raw data.